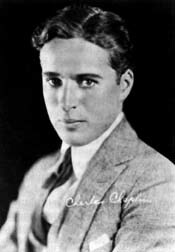 My Autobiography by Charles Chaplin. As I paid for it at the till the American lady picked up the book and looked at the cover. Suddenly with some surprise she exclaimed: “Oh my, is that…. Charlie Chaplin? He’s…” She swallowed the rest of the sentence with a knowing look. I nodded. Yes that is right, that is Charlie Chaplin. Sometimes there is more than meets the public eye. He’s my new crush. Slightly smug I walked out of the store, ready to be inspired by a very good-looking man.